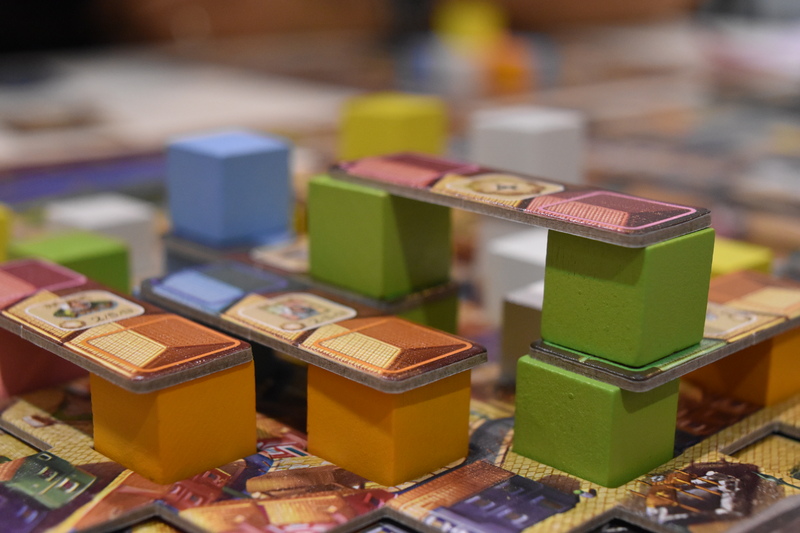 Essen Spiel still pairs well with German beer. Who knew. We’ll keep you updated tomorrow. A summary of Briony’s first day. Following on from yesterday’s report this post will bring you some coverage of the games played on day two. Each of the Misery Farmer’s have been frankly all over the place today, and a wide range of games have been played, enjoyed and pondered. Briony however has had an excellent day full of fried potato spiral’s and mega-complex games that she is just itching to talk about. The first game Briony played was actually Liguria on recommendation from Lizzy and others the day before. It turns out painstakingly painting your home city’s Cathedral by travelling from port to port, although seems boring, is actually great. She promptly bought the game and would like to assure all readers that it definitely more fun than it sounds. Stay off my island, guy. In traditional Essen fashioned they played this game because.. well because it was the only table available in the nearby vicinity. Fortunately for the team the game turned out to be a rather fun game about deception and calling your fellow players out. This is definitely what a medieval crack den would look like. Each person plays a character based in medieval England, overseen by the gruesome Sheriff of Nottingham. A player is dealt a hand of cards which may be green legal goods (apples, chicken, bread, boring things), or red illegal cards (which are not as illegal as they seem. Apparently medieval England really disliked pepper and silk). Each turn a player will select a number of good to put in their ‘swag bag’ which they intend to travel with. 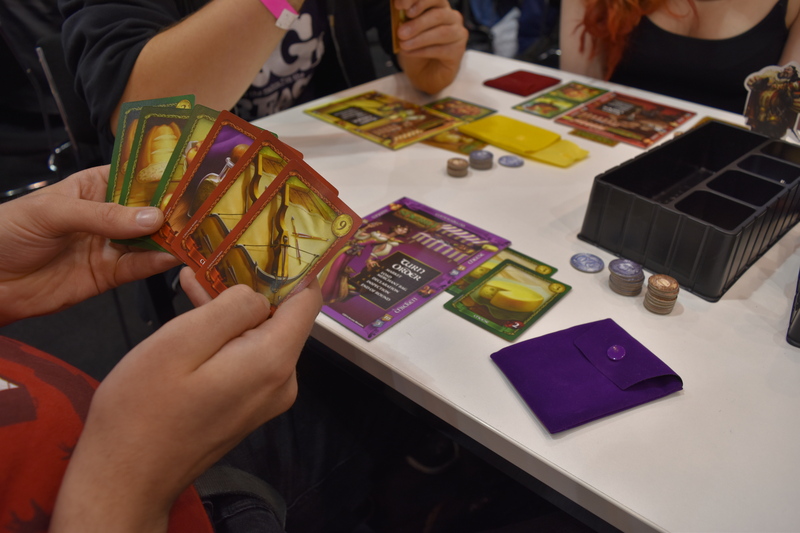 The player must declare what is in the bag to the Sheriff, with the intent of getting as many cards through his checks as possible. The sheriff decides based on your declaration whether he believes you or not, and may challenge to look in your bag. If you lied you can bribe him, but he may decide to take or ignore it. The aim of the game is to lie. Lie all the time, and then tell the truth to backfire on the Sheriff. If the sheriff is wrong about your lie, he must pay you in compensation, if you get away with it you rack up the monies. The moral of the story is that Sina is terrible at identifying lies, and lost on the most spectacular hands (5 whole apples!). Andromeda, predictably, was strongly generically alien themed. This much was obvious from 50 meters away due to the life-sized plastic alien model, but fortunately for the game it played better than the stall get-up indicated. Each player owns a race of aliens and must explore an ancient abandoned spaceship found floating in the galaxy. The ship has several compartments which must be explored. Who knew massive dice dependency could be a good thing. 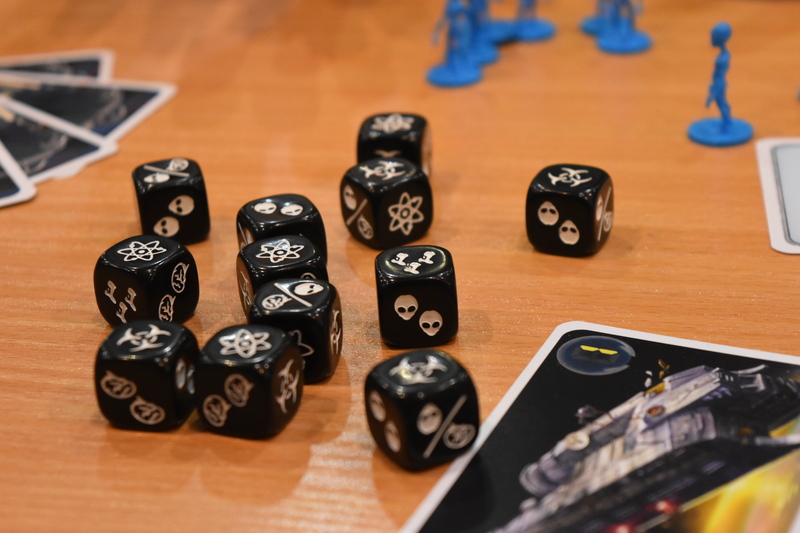 The main mechanic is rolling a handful of dice with different tasks represented. 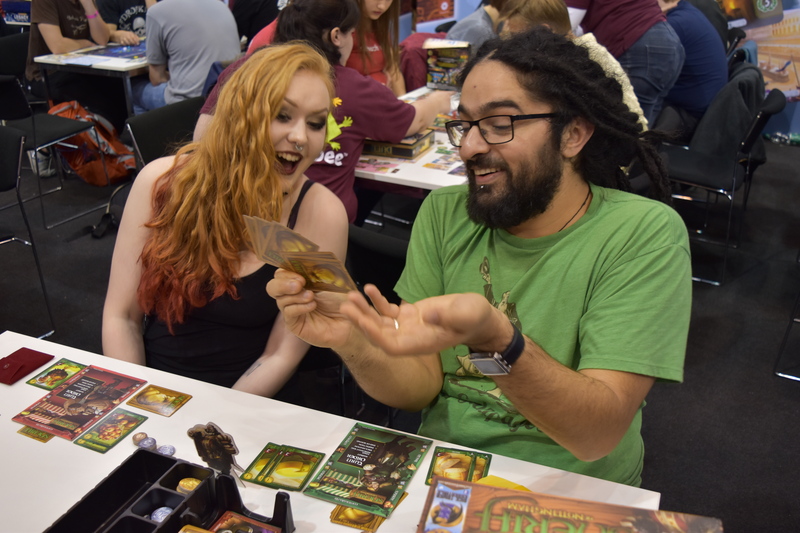 Interestingly, re-rolls weren’t allowed, and the first player ‘made up’ selections of dice to offer the other players in turn. They could choose to accept them, or to pass them on. If the hand of dice was significantly bad and every player passed, the first player who made it automatically has to accept it. This made making particular hands an intriguing mechanic. So far, this game has been the busiest to approach. 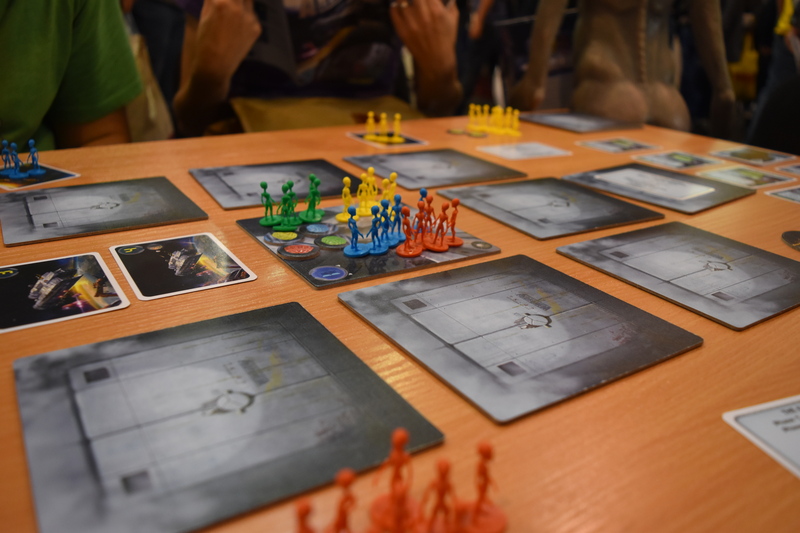 All of Essen want’s to play this, and their stock has more or less run out at the end of day two. Luckily two members of the Misery Farm cohort and partners have already bought this, and as Briony is currently writing this a game is being played in the background. 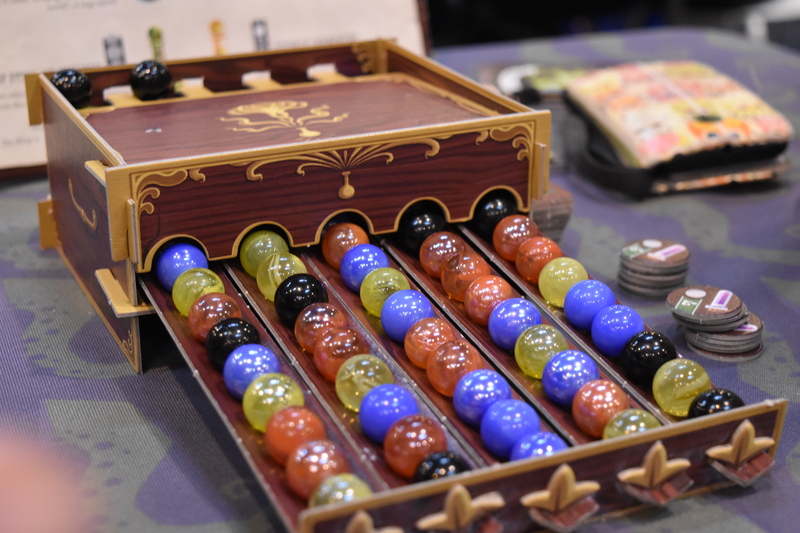 Potion explosion is basically a physical version of bejewelled, played with marbles. 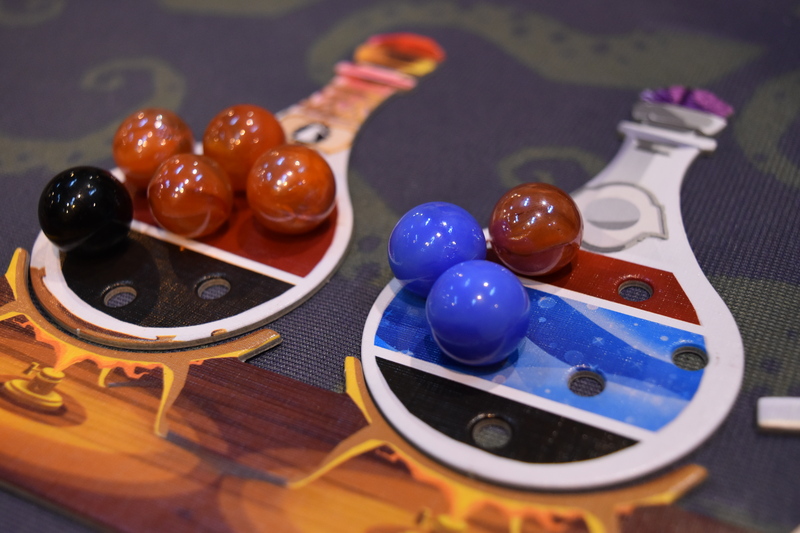 Each player has a potion with multiple colour requirements, and they have to select marbles of those colours from the centre magical trough. Once you fill the potion with the correct marbles you can use it’s effects i.e. take two specific marbles, steal another players stock etc. If, when you pull a colour out it causes two colours of the same colour to roll together (know as the ‘explosion’ part), you get to take those marbles too. The idea is to select a marble that gets you the most in your hand to create more potions. Its fun, fast paced, and colour based. A perfect game to play between epic saga games or simply if you like marbles. Either or, really. The person with the most completed potion’s worth the most points wins. If only all magic was this easy. This is single handedly one of the most complex board games ever conceived. Team Briony and co. only played 1/4 of the game due to the waiting list being fully booked, and it still partly made their brains melt. 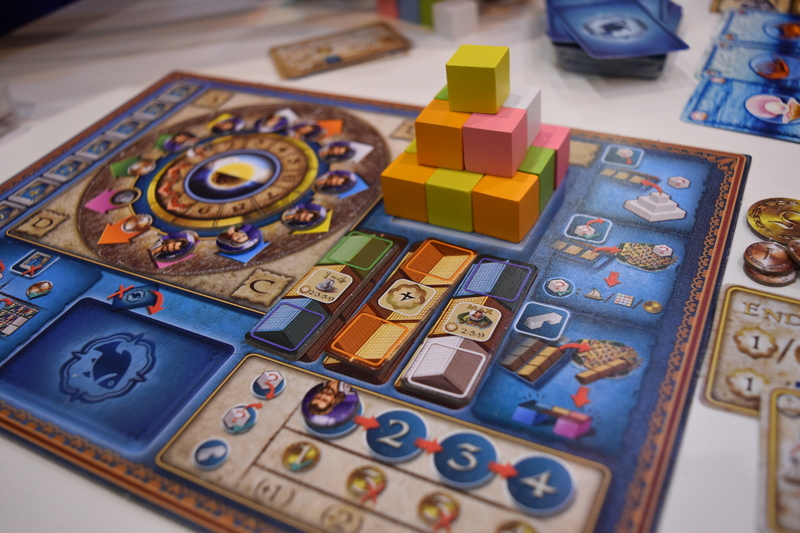 The combination of mechanics and strategies are extensive, and are coupled with new mechanics that they had not encountered before such as the resource pyramid (where only certain resources are available at certain times). 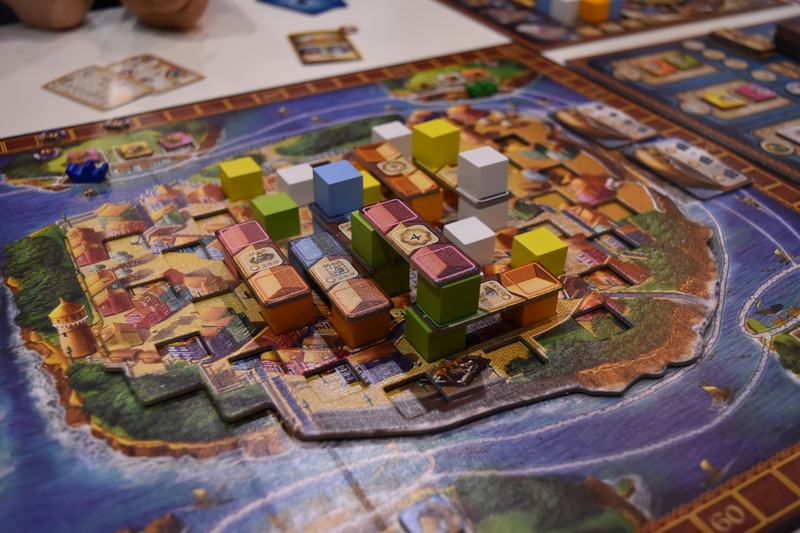 The game is based on the island of Burano, in Venice. There is a city in the centre island that has coloured houses (in reality these are the most satisfying coloured cubes ever seen). 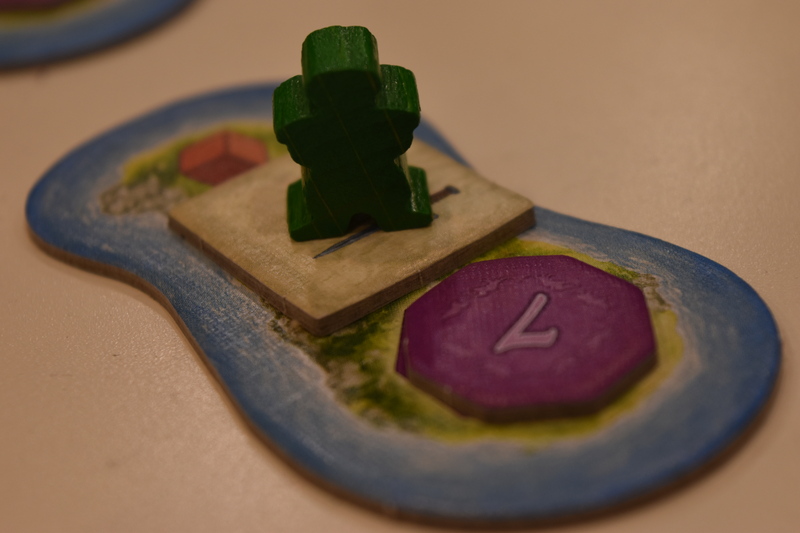 You each play a family who must fish, make lace (as was the tradition at the time.. mainly for the ladies.. stupid history..), and build more houses on the island. Once enough houses are built players may build roofs to connect houses, making spaces above them to become available. That’s right kids, it’s a 3D build em up worker placement game. It’s as rare and magical as unicorn to find a fully functioning, beautifully designed one of these, which most importantly actually works. Despite the complexity the game is awesome. It’s definitely for the experienced gamer, and there is more or less no way to have a good first season due to the how much the player needs to know to kick things off. 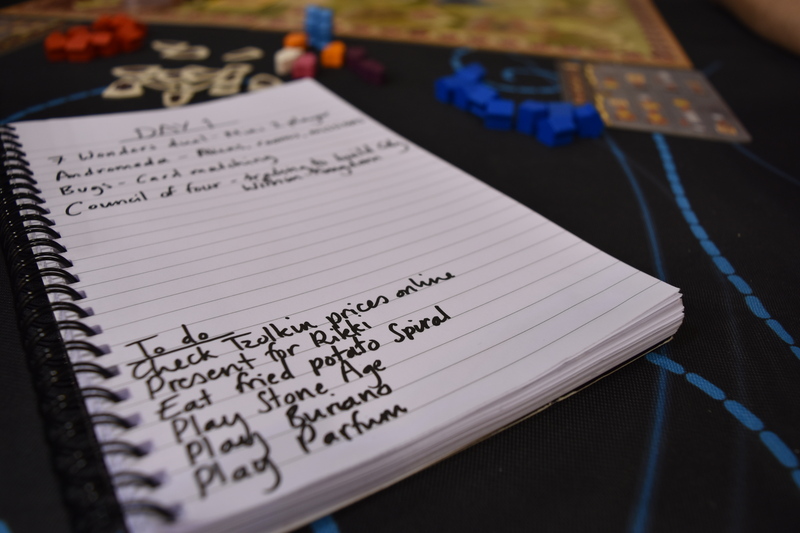 In fact it’s complex enough not to go into much detail about it, but fear not, Briony is probably going to sell all of her worldly goods to acquire this game and then write about it in the future.